With his own uniform, employee pins and a custom cake, Lawson truly partied in style. Natalie Cooper of Buford, Georgia, is the mother of four kids — ranging in age from 9 months to 9 years — so to say she’s hosted a lot of birthdays over the years is an understatement. Earlier this month, when it was time to plan a party for her soon-to-be 3-year-old son Lawson’s, she decided to get creative. Cooper's family frequently eats at Waffle House since it’s quick, convenient and budget friendly. And Lawson particularly loves breakfast food — and not just for breakfast. And since he can have breakfast food any time of day at Waffle House, it's become his favorite place to go. Thus, the idea for a Waffle House birthday party was born. Cooper also told TODAY Food that Lawson has a love for pins and keychains and "anything that dangles." That love inspired last year’s creative birthday: a “junk party,” where everyone brought him something from their home junk drawer! 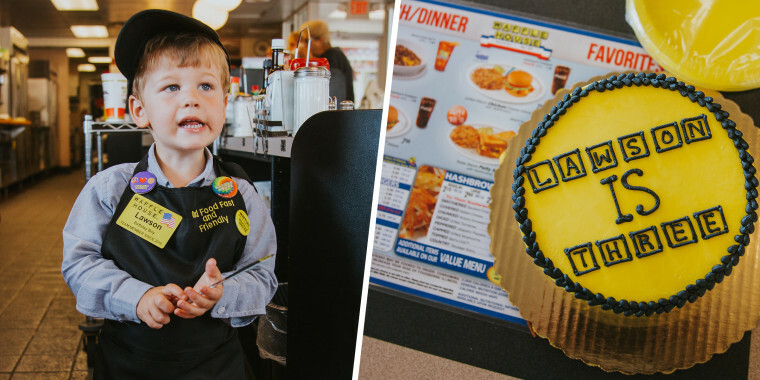 “With his love of pins and his love of breakfast food, Waffle House was just the perfect choice,” said Cooper, who really went all out for the celebration, which they held on Saturday. Ashley Donahue of Emerald Creek Photography captured the adorable event. For the cake, Cooper took Lawson to local bakery The Baking Grounds to pickup the custom creation. The 3-year-old chose Waffle House-yellow for the icing and selected chocolate for the cake to match the restaurant’s colors. They also worked with the decorators to make the design look like the restaurant's logo. Lawson even got his very own Waffle House uniform to wear to the big event. Cooper ordered the mini apron and hat online and had a friend embroider it. The waffle-loving birthday boy was also in for another treat. A family friend who works at the company’s corporate office scored him a “real” nametag. And, to top it off, when Lawson arrived, restaurant employees decorated him in official Waffle House pins. Cooper made goodie bags for everyone in attendance, which included about 16 family members, including both sets of grandparents. Partygoers received breakfast-themed treats including candy "fried eggs," a bottle of syrup, bacon jerky and coupons for free waffles.